While there are several decent but very low cost VHF/UHF rigs out of China so far this is the first HF transceiver I've come across. For $200 built, including Icom compatible microphone, a few of us have bought them. Here's a video of a QSO with Stephen, VK2BLQ. 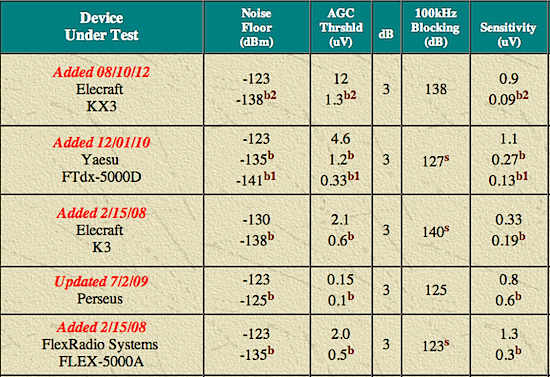 The KN-Q7 was designed by BA6BF and uses familiar components such as NE602s. The kits or assembled units are available from CRKits from US$115. It's a crystal VXO arrangement and you order according to the sub-band you want. The case is very solid and will survive a trip in a backpack with no trouble, coupled with low power requirements, this makes an excellent QRP rig for camping or emergencies. Adam Rong, BD6CR/4, provides excellent service and communicates well via email. The manual, which includes a full circuit diagram is here. I received a nice note from Adam, thanking us for the writeup. Cheers Adam! Each morning I travel to work by bus. 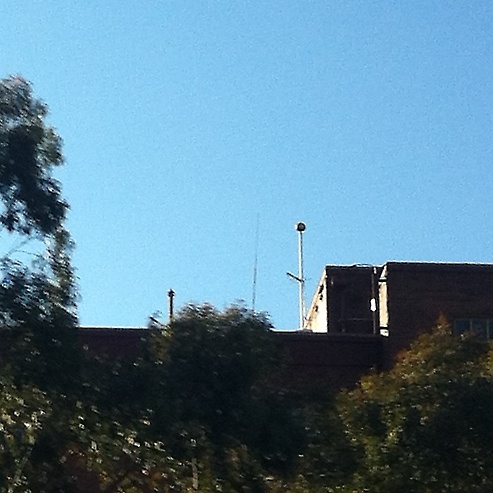 Mal, VK2BMS, drew my attention to an interesting antenna that is visible on the left as you start on the Sydney Harbour Bridge. I captured this on my phone through the bus window and high speed, that's my excuse. 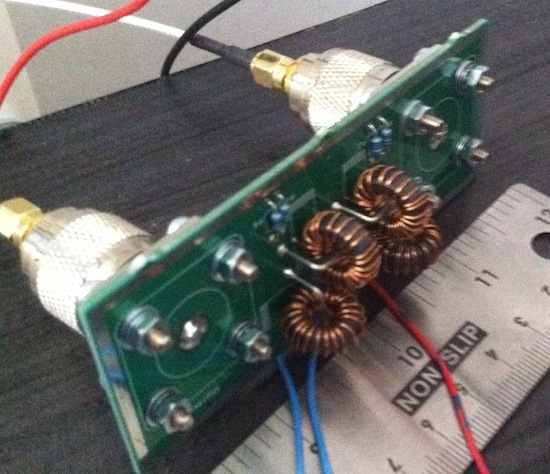 Mal writes: "The domed rod on the right is a lightening conductor and left is a Hygain 40 to 10mx trap vertical 14AVT of the late Ray,VK2BBP. It looks professional and repair people on the roof probably think it's part of the building or don't know what it is and frightened to touch it." Not sure that being pointy and higher than a nearby lightning conductor is a good idea. 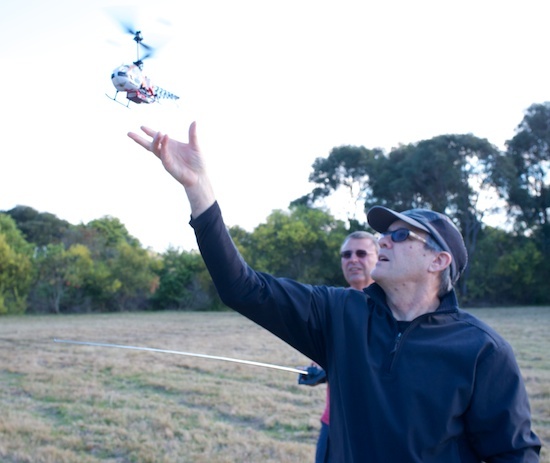 We headed for a local park armed with two model helicopters, one traditional, the other was a Parrot AR drone version 2. The difference is amazing. To be fair, the old one is pretty beaten up and the gears are grinding. Still good fun. 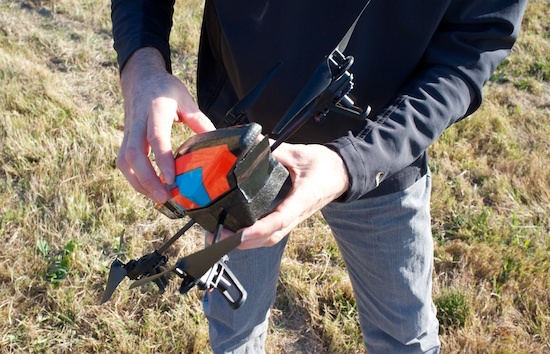 The Parrot AR drone creates a wifi network that you join with an iOS device. The software has "absolute" mode where you tilt in the direction you want the drone to fly and it takes care of figuring out which way it's facing, which is the hardest part about flying these things. Let's hope the military never gets hold of this technology.. Yesterday afternoon, I finally got the Digital SWR/power meter kit from Radio-Kits in the UK and built it last evening. A very straight forward build as all the parts came in separate zip-top bags wit a component list in each. Instructions for building are down-loadable from the above site and are quite complete. I added all the resistors first, capacitors, diodes, transistor and then the op-amp IC. The PIC was socket mountable so that remained out until the "smoke test!" There are two boards, firstly the main meter and control board and the detector board, both can be built concurrently as there are resistors, caps and diodes on the detector, as well as the toroids and sockets. It passed the "smoke test" - a check of DC resistance (using diode setting on the meter to make sure semiconductors did) and then I connected the 9V battery. Display lit up and no pops, bangs or smoke! I then adjusted the display contrast pot and the display showed all the right screens so all appeared to be working OK and first time, no diagnosis needed at all!! I waited until morning to test on RF as the WSPR station was in use all night. Morning, put the device in line between the SGC MAC-200 tuner and the transceiver and got readings that I was able to play with. The SWR showed 1.72:1 so I was a bit suspicious, however a dummy load showed 1.0:1- good! I then QSYed from 40m I was using for the initial test to 17m and the SWR dropped to 1.29:1, better but not wonderful. I do realise that the MAC-200 is not designed to auto-tune at low powers, so maybe I was a bit unfair. 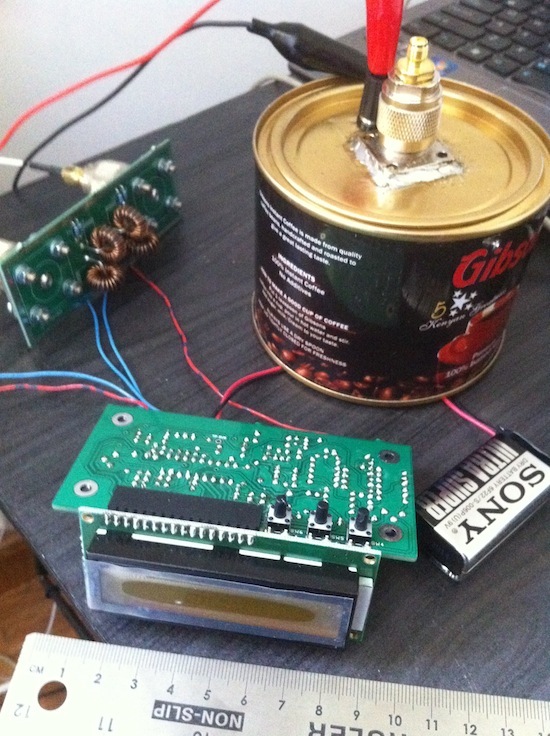 I then calibrated the power readings using my coffee can dummy load with diode inside to measure the peak voltage across the dummy load. It calibrated nicely. Finally, I thought I would insert the LDG Z11ProII inline and got a nice low reading on 17m of 1.04:1 - much better. The LDG is much happier tuning at very low powers. I've attached some photos of the device on the test bench with a ruler lying beside, so one can see the dimensions clearly. My only criticism is that the only case available tom R-K with the kit, is way too big - I could probably fit a couple of Ensemble RxTxes in with it! Very happy with the kit as with the built-in 9V battery it is entirely stand-alone. We've had very big winds here in Sydney over the past 24 hours. The half G5RV between tree and house broke at the centre insulator due to unexpectedly large tree movement. I've repaired it today and have been tuning around listening to all the stations in the contest today. My favourite rig these days is the Elecraft KX3, which has always seemed very quiet and well behaved. Turns out it's just topped the chart at Sherwood labs. Their ranking is by "dynamic range narrow spaced", which I don't fully understand but presumably means it behaves well when a strong signal is very close to the frequency you are listening to. The next rig on the ranking has a list price of $7,700 so that makes the KX3 a real bargain. It looks like it's uncommonly sensitive too from the table snippet above. I find the KX3 a very quiet receiver, my only wish is that the tuning knob would spin freely but that's a minor quibble.